No matter how people broke things down or what record they may have predicted heading into the 2018 regular season, there’s no question the 2018 Pittsburgh Steelers were considered Super Bowl contenders. Even after an 0-1-1 start that includes a tie with the Browns and loss to the Chiefs in-which the Steelers defense was totally embarrassed by Patrick Mahomes, it would be foolish to give up on a true Super Bowl contender this early in the year. But that would only be if we’re talking about a true contender, something recent trends suggest the Steelers are not. Why do I say that? Because the Steelers have lost three straight games–all at home–to teams that are among the best the AFC has to offer. The first loss came last December 17, when the Patriots stunned Pittsburgh with a 27-24 victory that many thought was a miscarriage of justice, thanks to the controversial reversal of a Jesse James‘ touchdown with just seconds remaining. Had Jesse James touchdown stood, it would have likely given the Steelers a 31-27 victory and the inside track to capture the AFC’s top seed. OK, if the reversal of the Jesse James’ touchdown indeed was a miscarriage of justice, how can I hold that against Mike Tomlin and Co.? Because Mike Tomlin, former offensive coordinator Todd Haley and quarterback Ben Roethlisberger appeared to panic (or at least failed to communicate properly) during the sequence of plays that followed the reversal, and Roethlisberger wound up throwing an ill-advised pass that was deflected and intercepted in the end zone. There’s no way that game should have ended in regulation. 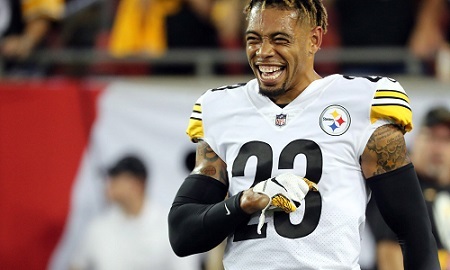 To make things brief, I will just combine the last two games that saw the Steelers defense yield a grand total of 827 yards and 80 points in back-to-back losses to the Jaguars and Chiefs. 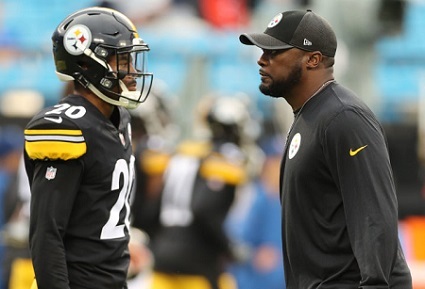 The loss to Jacksonville last January 14 came in a playoff game at Heinz Field and put an end to a 2017 campaign in-which the Steelers, who finished 13-3 during the regular season, appeared to be destined for a rematch with New England in the AFC Championship game. As for Week 2’s defeat to Kansas City, the performance of the defense was so alarming, it made one absolutely dread the regular season rematch with the Patriots this December at Heinz Field. As I said, it is really early, and the Steelers wouldn’t be the first team to start a season slowly before showing its true championship colors. 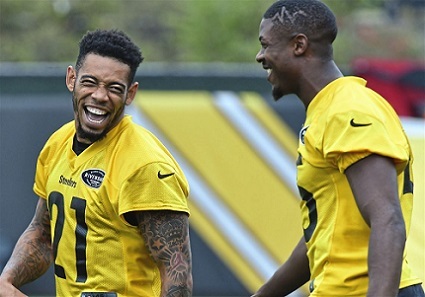 However, 2017, one in-which they struggled to defeat some of the more mediocre teams in the NFL on a weekly basis, often needing kicker Chris Boswell to bail them out with game-winning field goals in the final seconds, may have been the true colors of the Pittsburgh Steelers–maybe it just took the top contenders in the AFC to flesh them out. Taken from the grade book of a teacher who is enjoying the manic surge of his schizophrenic students, here is the Pittsburgh Steelers Report Card for the 2017 win over the Kansas City Chiefs at Arrowhead. The Haley haters who’ve been clamoring to see more Roosevelt Nix and rushing out of the I-Formation got their wish. The Steelers ran the ball early and often and with great effectiveness. Nonetheless, too many drives stall in the end zone, and the Steelers offense is struggling to convert 3rd downs. The Steelers offense found a way to win, but the unit only managed to put 17 points on the board. Keith Butler had his unit primed and ready to play. 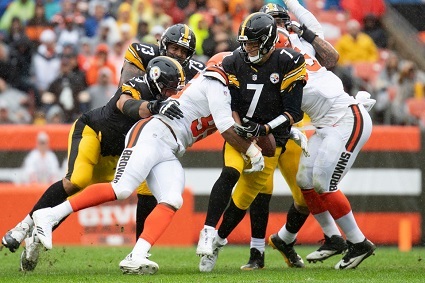 The Steelers went into the living room of the NFL’s best offense and completely shut them down in the first half – had it been a amateur wrestling matching the defense would have scored a technical fall. 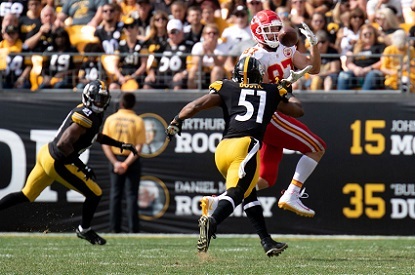 While its true that Kansas City’s late touchdown came a little too easily, it is also true that the Steelers defense got stuck defending a short field with two minutes left to play and completely stone walled the Chiefs. This gentleman’s been quiet thus far in 2017 and in fact has been called out for lapses in any number of post-game film analysis on several occasions. But he’ll earn no such criticism from the Jon Leydard’s of the world this week, as he led the team in tackles, and came away with a critical pass defense in the end zone on 4th and Goal. For that Sean Davis wins the Unsung Hero Award for the Steelers win over the Chiefs. Its that time again Steelers Nation. The Pittsburgh Steelers limped into Kansas City’s Arrowhead Stadium following their humiliating defeat at Heinz Field at the hands of the Jacksonville Jaguars and emerged with a hard-fought 19-13 win over the Chiefs. As we do after every Steelers win, we give you citizens of Steelers Nation a chance to vote Steelers game ball winners. While Ben Roethlisberger certainly didn’t play his best game vs. the Kansas City Chiefs, he did look far better than he had the week before. But Ben Roethlisberger’s best move was perhaps to hand the ball to Le’Veon Bell, who looked like his old self in rushing for 179 yards on 32 carries. Big Ben’s next move was to throw the ball to Antonio Brown, who looked simply spectacular in torching the Chief’s defense for 8 catches for 155 yards which included an electrifying 51 yard touchdown. Tight end Vance McDonald also gets a nod. He only had one catch, but it was an important one that got the Steelers out of their own goal line. Those four men earn ballot positions for the offense, but remember, you can write in James Conners, Terrell Watson, Martavis Bryant or any other offensive player you wish. On the defensive side of the ball, Sean Davis earns a ballot slot for leading the team in tackles and defensing a pass in the end zone. Vince Williams also gets a nod, thank to his smart two sack performance prior to leaving the game with an injury. James Harrison also gets a nod, thanks to his critical sack on third down during the Chief’s final drive. Remember, you’re not limited to these choices. Think that Ryan Shazier, Stephon Tuitt or Cameron Heyward deserve a game ball? No problem, write their names in. Better yet, leave a comment stating your case. Thanks in advance for voting, and be sure to check back later for Steel Curtain Rising’s full analysis of the Steelers win over the Chiefs at Arrowhead.